Get ready for things to get a little weird. The freaks at Gnu are absolutely nuts about snowboarding and aren’t afraid to let their crazy side run wild. 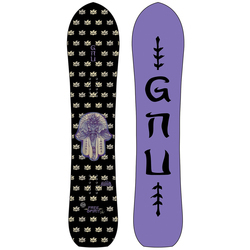 Fueled by insanity and delirium, Gnu dreams up and creates snowboards that make the sport more fun than anyone could have ever fathomed. Back in the ‘80s, Mike Olson was building boards with all new concepts and ideas that were considered by many to be too wacky in terms of design to ever be successful on the mountain. As it turns out, Mike was just ahead of his time. Refusing to listen to his critics, Olson founded Gnu Snowboards and has been progressing the sport ever since. Gnu is manufactured up near Canada in the state of Washington by Mervin, (the same folks who build Lib Tech gear). 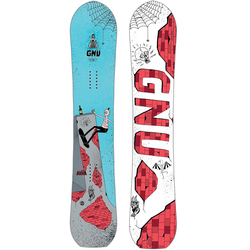 Out of what is considered to be the most environmentally friendly snowboard factory in the world, Gnu boards are hand built by snowboarders who are wild enough to pioneer game changing technology such as the original reverse camber boards that also feature Magne-Traction. Dudes, Gnu has a whole stash of boards prepared to rip, slash, and tear their way through anything you can think up. 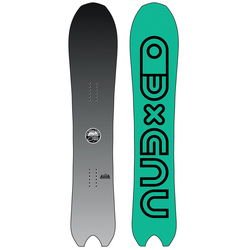 For those who are just learning to connect their turns to riders who are looking to progress their game, the Gnu Carbon Credit BTX Snowboard is the stick for you. As a freestyle performance board suited for any terrain, the Carbon Credit is a mid flex rockered board that is stable enough to hold an edge on the hard pack, but light enough to float through any amount of powder. Take things to the next level with the Riders Choice C2X. No matter where on the mountain you take this board, you can expect superb stability, powerful pop, and bomb balance thanks to Gnu’s signature Magne-Traction and banana camber. Unleash unheard of amounts of shred upon the backcountry with the Billy Goat Split C2X Snowboard. This beast comes geared up and ready to tackle any challenge with a stiff flex, banana shape, and the ability to split into skis so you can go further into the unknown than you ever thought possible. Ladies, Gnu delivers the goodies for you as well. The B-Nice BTX Board features a true twin rockered shape, sustainable wood core, and Magne-Traction give you a ride that just oozes sass all over the mountain. The park will never be the same after you strap into the Purple Pickle PTX. A mid flex, asymmetric sidecuts, lots of pop, and a catch-free ride will have you stomping the most outrageous of shenanigans. Your all-terrain, all-mountain free ride dream has finally come true with the B-Pro C2X Snowboard. No matter the conditions or features, the B-Pro enlists all of Gnu’s finest technology to rip like no other. Weird. Crazy. Insane. Call it whatever you want, but Gnu is just a bunch of people who are out of their minds and make boards that are out of this world.